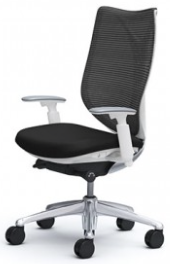 Okamura reclined work chair - Sitting Safely? OKAMURA, ATLAS chair & Cruise concept. 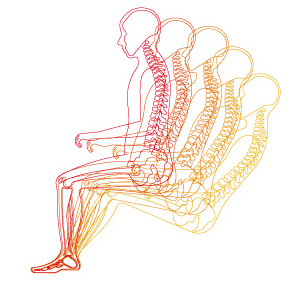 Okamura is a major Japanese company and produced a reclined work-chair that was ahead of the field in addressing the biomechanical factors that are necessary to avoid or limit LBP. The upright mode is in an adverse mid-upright position in its worst form, and the less adverse intermediate positions are allowed. Improvements could be made, particularly to the positioning of the headrest which requires manual adjustment to provide the necessary support in the reclined mode. As can be seen in the brochure photographs this is not done. The method of changing from reclined to upright mode involves raising or lowering the seat. There is a plethora of unnecessary controls. 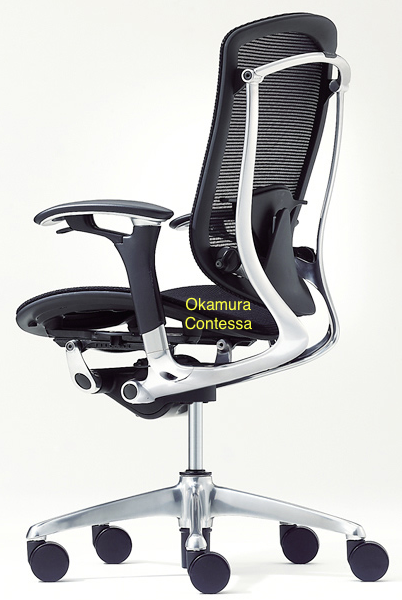 As the 2T concept was considered ‘outlandish’ back then, this chair was a considerable leap forward by Okamura. It has been suggested that Okamura designers had seen my web page. I doubt this as they had failed to apply the essential requirements need to make this a more user friendly (and cheaper) work-chair. However, congratulations to Okamura. Also their Atlas model allows some insights into where their design went wrong in relation to the 2Tilt (2T) concept. 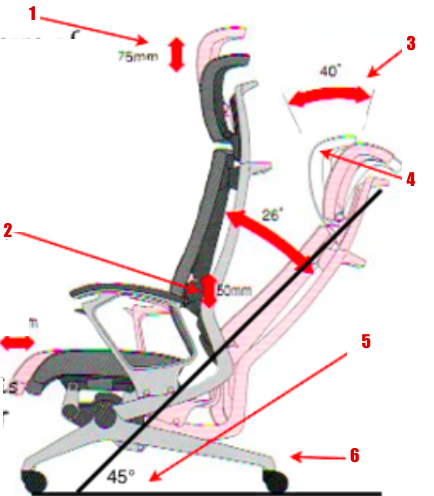 Problems occur with the further design and is unintentionally shown in the photograph, above, as the users head is not being supported although there is a possible 40° forward adjustment. This illustrates the point that adjustments are usually maladjusted and have confusing controls. 2. Pelvic support should be at 200 mm. and not adjustable. Usually adjusted to an adverse lumbar height. There is no need for adjustment of the depth of the seat with a 2T design. 3. Also no need for this adjustment. 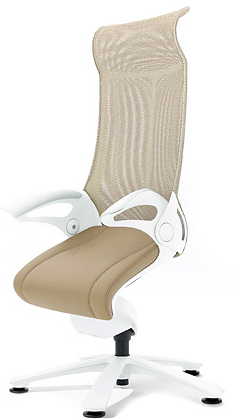 If the FTS upright system is used, the headrest remains well behind the users head, no adjustment being required. This becomes more complicated if a pelvic support system is used for the upright mode. See note below. 4. In the reclined mode the head-rest needs to be at about 6″ forward from the back-rest. 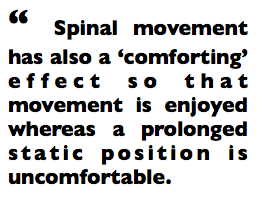 This depends on the degree (up to 40°) of thoraco/upper lumbar kyphosis designed into the back-rest. 5. Good. The reclined back-rest angle is 45°. Better at 40°. From the diagram it can be seen that there are some controlled adjustments which are sub-optimal and would be avoided in the 2T concept. The upright mode is in the usual mid-upright position which may incurs a 40% axial compression penalty (Nachemson, Sato34 but not Wilke1) over standing and 500% over lying supine. The less adverse intermediate positions are allowed. The 2T concept allows intermediate positions but these are unstable and can allow rocking exercise. The mid upright mode could be partially mitigated by correctly placed iliac support. The emphasis here must be on ‘correctly placed’ and this can be easily adjusted into an adverse position which is not allowed in the 2T concept. (Pelvic support →). The user can also sit on the front edge where the seat is tilting downward as a FTS and where the head rest becomes irrelevant. Feet would have to be braced against the floor to prevent slipping (See below). I found the shift from the reclined mode to be awkward and difficult but can probably be eased by adjustment and familiarity. Ideally, for the ‘2 Tilt concept’ this should be easy and without adjustment with the intermediate positions being unstable and can allow rocking exercise. Ways may be found for this to be acceptable in a 2T solution, where there is a specified requirement for support from head to feet. One solution is a leg/footrest that is retracted in the upright mode. 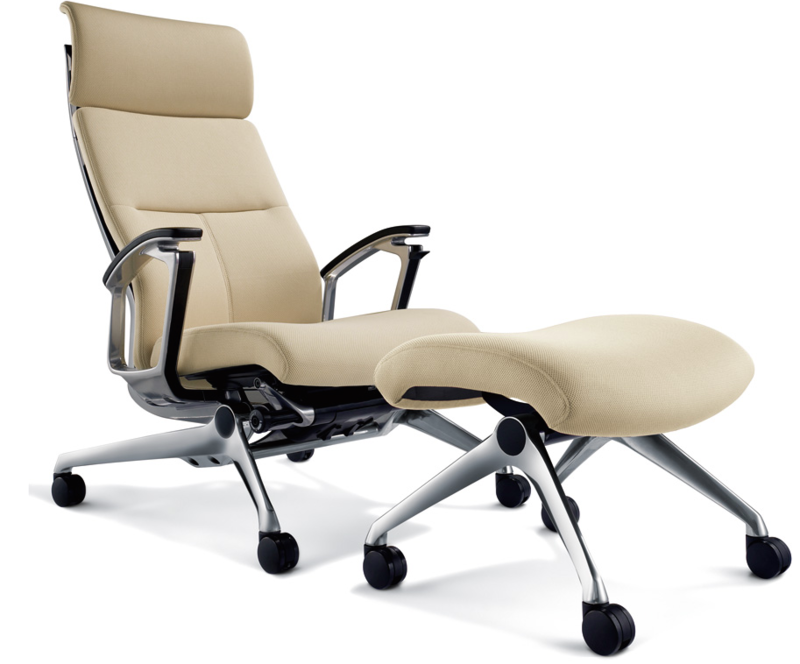 It has plenty of room for improvement but the Atlas was the only chair designed for work in a reclined mode. As combined with the specific desk it is awkward but a formidable (but expensive) buy, and especially for those working in a trading environment. 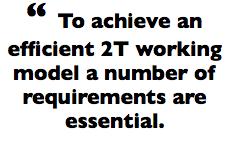 Failure to take account of the necessary requirements for a reclined work mode (the 2T concept) has resulted in a clunky model resulting in, I think, a poor user uptake. A pity! (See Requirements →). With the system shown below Okamura demonstrates the problem when the floor is used as the footrest in the reclined work position. The work top would have to be very low and would be too low when in the upright mode. The solution involves either automatically raising the work-top when entering the upright mode with a related variable height desk. The problem is avoided with a desk-less work station. Okamura work chairs are good of their sort but have failed to produce a 2Tilt model. 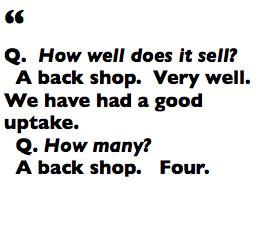 but nearly there …. The Contessa has pelvic support and a domed seat (ischial off-load) and the Leopard has FTS which might have a problem with slippage. The Luxos is sort of reclined with a stool for a leg-rest. Good pelvic support and a forward tilt which are alternatives and not complementary but equivalent to Ischial offload system. In this photograph the headrest is well out of the way in the upright mode. This entry was posted in Uncategorized on May 21, 2015 by Dr. Henry Sanford.